For over 25 years, Paul Wiegand GmbH has been an acknowledged specialist supplier of spare parts to the waste disposal industry. All over Germany and Europe, more than 4,500 customers put their faith in the company’s product quality, expert advice and outstanding parts availability. Europe-wide delivery of all orders within 24 hours, thanks to our superior logistics concept. All parts and custom-made products meet the highest quality standards. We carefully check this before delivery. 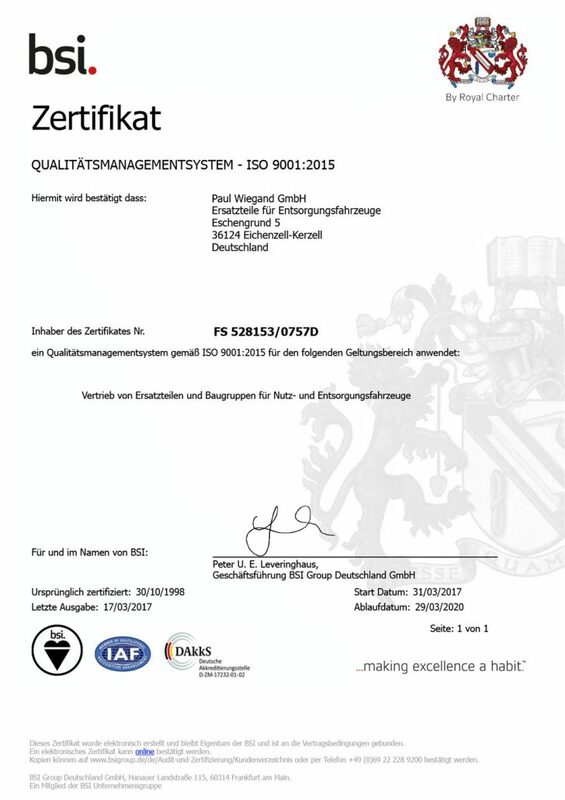 We are DIN EN ISO 9001 certified. Attention, a sense of responsibility, appreciation and transparency are values you can expect from each and every one of our members of staff. Every last one brings his expert knowledge and skills to the table to meet what are at times extreme challenges. Save time and money click after click! Register at our online shop and become part of the wider Paul Wiegand family. As a registered customer you can view our prices and quickly order online – at favourable prices. Paul Wiegand offers large customers with their own SAP-based goods management system the option of an efficient link to the PW online portal. A company’s spare parts requirement can therefore be directly determined from the SAP system using a proprietary OCI interface, and automatically retrieved from the Paul Wiegand online shop. Paul Wiegand’s IT experts are happy to assist with more information at any time. 20,000 combinations and we know them all! We also offer individual non-standard solutions and custom-made products. Our heroes will take care of everything! Take full advantage of our services! Everything you need for refuse collection vehicles, sweepers and municipal machines. We fulfil your every need. From bolts to assemblies, cylinders to controls blocks, hydraulic pumps and hydraulic motors, wear plates made of ultra-hard Hardox, Telma retarders, camera systems, innovative CEJN hydraulic clutch systems, lights and rotating beacons. We have unique solutions to meet your particular requests. Paul Wiegand guarantees customers an extremely high level of reliability. Yet we do not stop at simply fulfilling the prescribed standards and having these regularly checked by independent auditors. Instead, we consistently seek to maximise and optimise our processes and levels of quality. In construction, logistics and customer service we thus strive at all times for the best possible outcome for the customer and do, indeed, achieve this. The entire Paul Wiegand GmbH concept is based on the perfect interplay of technical and commercial processes. From choosing suppliers, to internal processing all the way to dispatching consignments: nothing is left to chance. And that’s something that customers all over Europe can always rely on.